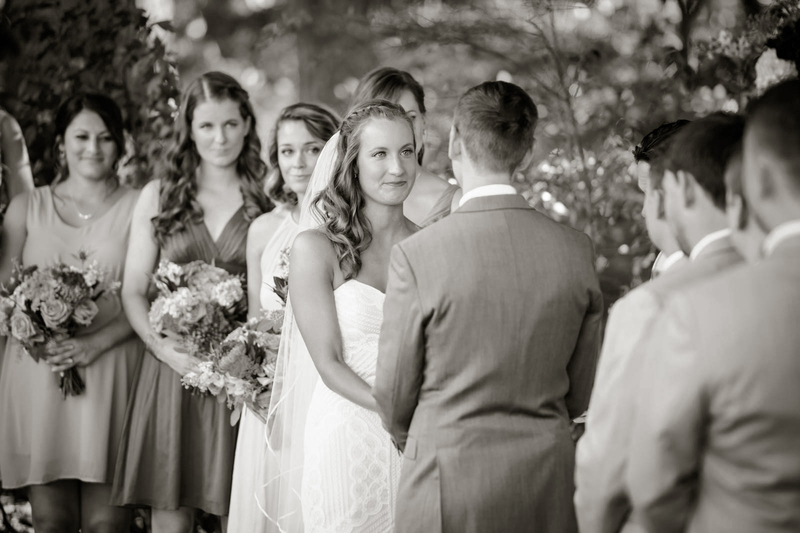 A bride lovingly admires her soon-to-be husband and begins to tear up during an outdoor wedding ceremony at The Farm in Candler, NC. This was one we will never forget. This breath taking outdoor wedding at The Farm in Candler, North Carolina was one we traveled to through the Blue Ridge mountains near Asheville, North Carolina to get to. This venue is a family run actual farm but now also hosts weddings and different events on their land. The ceremony took place under a Large oak tree with white chairs outlining the isle. This sweet picture captures the brides excited nature trying to hold back a smile as she gazes into her grooms eyes as he recites his vows. Everyone listens and leans in eagerly to hear what other soft, kind words he says. We thought this picture suited a black and white tone because it really made the bride stand out among the rest because her emotion was what we were going for along with just capturing her beauty on that day.